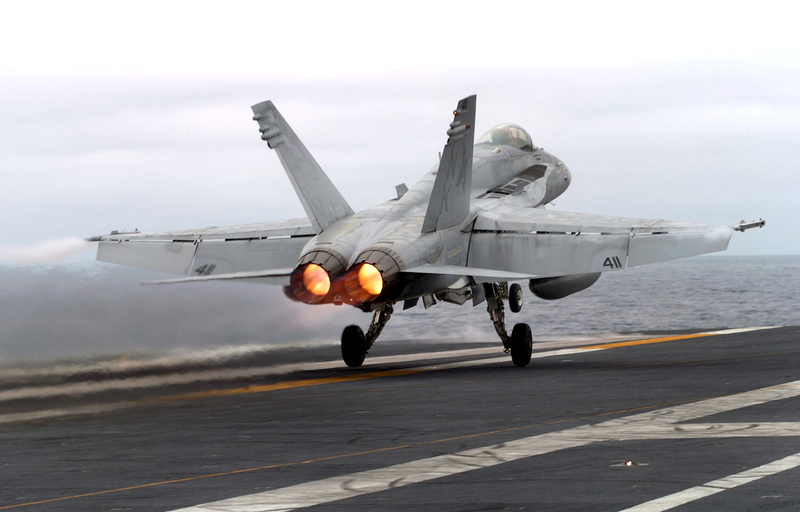 An F/a-18c Hornet Assigned To The Fist Of The Fleet Of Strike Fighter Squadron Two Five (vfa-25) Goes To Full Afterburner As It Performs A Touch-and-go Landing Aboard The Nuclear Powered Aircraft Carrier Uss John C. Stennis (cvn 74). An F-14d Tomcat Assigned To The Tomcatters Of Fighter Squadron Three One (vf-31) Sits Poised For Launch On One Of Four Steam-powered Catapults Aboard The Nuclear Powered Aircraft Carrier Uss John C. Stennis (cvn 74). Aerial View Of The Nuclear Powered Aircraft Carrier Theodore Roosevelt With Her Embarked Carrier Air Wing Eight (cvw-8). An F/a-18 Hornet Assigned To The Rough Raiders Of Strike Fighter Squadron One Two Five (vfa-125) Keeps Its Tailhook Up During Carrier Flight Deck Training Exercises.